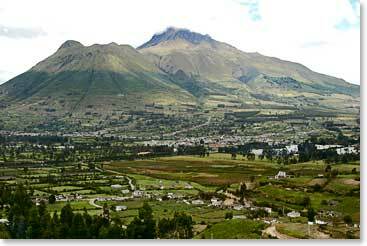 It’s 2:45 in the afternoon and I’m calling you from the top of Imbabura at 4600m/15,092ft above sea level. The entire team is all here at the summit, their first big climb of the trip. The team did very well; ascending first through the farmlands down below then through step grass as we climbed higher on this volcano and then eventually we went up on a mountain ridge that wound up higher and higher into the clouds. Finally we did some easy rock climb to reach the pinnacle that I’m calling you from now. I’m looking off into the mist at further pinnacles that are down below me on this complicated ridge and it’s great to be high on top of an Andean volcano. The bigger, glaciated peaks await us next week, beginning Friday with Cayambe. Everyone is getting along great. We are all having a great time together with lots of laughs and companionship. Now we are heading a longs ways back down to the valley. I’ll call again this evening so you know that everybody is back safe and enjoying the fires at the Hacienda. Bye for now! This is Mary from the office in Canmore with an update from Wally. Everyone got down the mountain at about 5:30 p.m. and is looking forward to some well deserved rest and relaxation back at the Hacienda! The entire team is doing really well and they had a lot of fun today on the climb. Stayed tuned tomorrow for some photos of today’s journey.